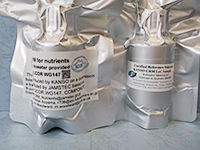 SCOR-JAMSTEC CRMs are certified reference material (CRM) for inorganic nutrients in seawater. These were produced by KANSO Co., Ltd. on a commission basis using the facility at KANSO Co.,Ltd. (see CRM production procedure web page make link here) that has been producing KANSO CRMs for more than a decade. This certified reference material has been produced using autoclaved natural seawater on the basis of quality control system under ISO Guide 34 (JIS Q 0034). Candidate RMs of National Metrology Institute of Japan (NMIJ) CRMs were also manufactured using the same facility at KANSO Co., Ltd. that was used to produce both the SCOR-JAMSTEC CRMs and the KANSO CRMs. The certified values are arithmetic means of the results of randomly selected 30 bottles from each batch (measured in duplicates) analysed by KANSO Co., Ltd. and Japan Agency for Marine-Earth Science and Technology (JAMSTEC) using the colorimetric method (continuous flow analysis, CFA, method). The salinity of calibration solutions were adjusted to the salinity of this CRM ±0.5 g kg-1. Each certified value of nitrate, nitrite, and phosphate of SCOR-JAMSTEC CRMs were calibrated versus one of Japan Calibration Service System (JCSS) standard solutions for each nitrate ions, nitrite ions, and phosphate ions. JCSS standard solutions are calibrated versus the secondary solution of JCSS for each of these ions. The secondary solution of JCSS is calibrated versus the specified primary solution produced by Chemicals Evaluation and Research Institute (CERI), Japan. CERI specified primary solutions are calibrated versus the National Metrology Institute of Japan (NMIJ) primary standards solution of nitrate ions, nitrite ions and phosphate ions, respectively. For a certified value of silicate of SCOR-JAMSTEC CRM was determined by one of Merck KGaA silicon standard solution 1000 mg/L Si traceable to National Institute of Standards and Technology (NIST) SRM of silicon standard solution (SRM3150). The certified values of nitrate, nitrite, and phosphate of SCOR-JAMSTEC CRM are thus traceable to the International System of Units (SI) through an unbroken chain of of calibrations, JCSS, CERI and NMIJ solutions as stated above, each having stated uncertainties. The certified values of silicate of SCOR-JAMSTEC CRM are traceable to the International System of Units (SI) through an unbroken chain of of calibrations, Merck KGaA and NIST SRM3150 solutions, each having stated uncertainties. As stated in the certificate of NMIJ CRMs each certified value of dissolved silica, nitrate ions, and nitrite ions was determined by more than one method using one of NIST (National Institute of Standards and Technology) SRM of silicon standard solution and NMIJ primary standards solution of nitrate ions and nitrite ions. The concentration of phosphate ions as stated information value in the certificate was determined NMIJ primary standards solution of phosphate ions. Those values in the certificate of NMIJ CRMs are traceable to the International System of Units (SI). One of analytical methods used for certification of NMIJ CRM for nitrate ions, nitrite ions, phosphate ions and dissolved silica was colorimetric method (continuous mode and batch one). The colorimetric method is same as the analytical method (continuous mode only) used for certification of SCOR-JAMSTEC CRM and KANSO CRM. For certification of dissolved silica, exclusion chromatography/isotope dilution-inductively coupled plasma mass spectrometry and Ion exclusion chromatography with post-column detection were used. For certification of nitrate ions, Ion chromatography by direct analysis and Ion chromatography after halogen-ion separation were used. For certification of nitrite ions, Ion chromatography by direct analysis was used. NMIJ CRMs were analysed at the time of certification process for SCOR-JAMSTEC CRM and the results were confirmed within expanded uncertainty stated in the certificate of NMIJ CRMs.